•	assessment exercises to give you feedback on what your students are learning. A correction has been made to page 53 in this book. 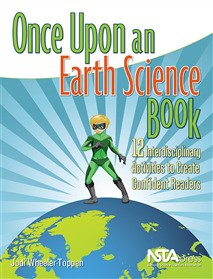 To view the update, please click here: Once Upon an Earth Science Book correction. Do your middle school/high school students have trouble comprehending expository/scientific reading? Do they read the material but have no idea what they read? If this is true, then this is a wonderful book for you! This book is impressive, and it’s easy to see it was written by a REAL teacher who thoroughly understands the problems faced by teachers whose students don’t think you need to read in science. The reading experiences highlighted in the 12 activities in this book focus in on skills needed for all readers: how to figure out the meanings of new words, including learning about text signals, chunking, cause and effect, problem solving strategies, comprehension coding marks, and the use of diagram and illustrations. Another focus is helping students work with claims, evidence, and reasoning. If the students make a hypothesis and do an activity, how can they justify their conclusions? All activities are connected with the Next Generation Science Standards and State Core Curriculum. After presenting lots of background information for the teacher on the theories behind the book, including comparing the learning cycle with scientific learning theories, each chapter includes one or two science articles for students to read. They would enjoy these articles, and learn science in spite of themselves. These are very interesting and seemingly easy to read but hidden within each is lots of science learning. For example, in the first chapter activity dealing with dinosaur tracks, which is itself a motivating topic, the students read about two dogs, one of which steals a bag of chips and leaves tracks in the nearby mud. Titled as Reconstructing the Past, comprehension coding is introduced. Group work, think–pair–share, and classroom discussion is highly encouraged. All needed worksheets, readings, further references, as well as detailed lesson plans listing the topics, reading strategies, lesson objectives (connecting to the NGSS), background, materials list, student pages, and exploration/pre–reading, journal question, and application/post–reading are provided. Other chapter topics are equally motivating: Trash Soup, The 20 Year Winter, and The Ocean on the Top of the Mountain are just a few. Each chapter focuses on one or two reading strategies. Students would find these topics highly motivating and would definitely learn from them. Ample references and connections for each chapter for the NGSS are provided. This is just one in a series of books by this author. I highly recommend this book. It is right on target for getting those students who really don’t particularly care for science involved in learning to read science and enhancing their reading skills for other subjects as well. These chapters and skills would appeal to all students but would especially appeal to those less skilled readers. Just a note: although it is not specifically recommended to do so, I believe the greatest use of this book would be to complete the chapters in the order presented as the skills taught do build upon themselves. Similar to the previous review, many good activities to engage kids (I focused on Chapeter 13, scale and size of the solar system) but having an accompanying website to print handouts (similar to how Solar Science was structured) or a section at the back with full size handouts, would be really helpful.